Do celebs intentionally take advantage of bigger holiday shopping crowds to step out and get some shopping done while feeling normal? I've never given much thought to this before, but we've seen more celeb snapshots from outside Barneys and inside popular LA shopping hot spots like The Grove this month than we have all year. 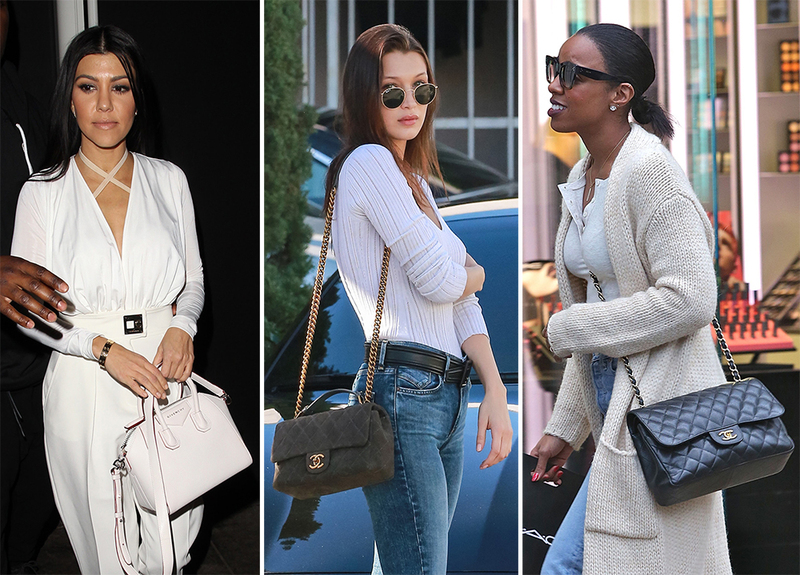 Celebs cannot stop shopping, and they look like they're having a blast and enjoying a greater degree of anonymity than they probably do during the other eleven months of the calendar year. Speaking as a "normal person," I'm probably less likely to approach someone I recognize from television when I'm already stressed out about buying a gift for my mother-in-law, so it seems like a pretty safe bet. Oh, by the way, we weren't lying about those Chanel and Louis Vuitton bags; you may be making a few additions to your own holiday wish list after you see them. Here's Gigi's little sister Bella Hadid, hanging out with her dad Mohamed Hadid in Beverly Hills. She's carrying a muted suede Chanel Flap. Kelly Rowland was recently spotted doing a little shopping at The Grove in LA with her own black leather Chanel Flap. Fargo star Kirsten Dunst looks amused here as she tries to wade through a throng of paparazzi outside LAX, but I'm deadly serious about her beautiful two-tone Louis Vuitton bag. Here's a jumpsuited Kourtney Kardashian, leaving The Nice Guy in West Hollywood with a petite, white Givenchy Antigona. We all know Givenchy is one of Kourtney's favorite handbag brands, but could we have ever predicted she'd randomly start hooking up with Justin Bieber? No. No, we could not have. Meanwhile, Kourtney's mom Kris Jenner and sister Kendall Jenner were seen shopping together at Barneys. Kris is carrying a bright red croc Birkin (as if you could miss it). Actress Lucy Hale was also spotted at The Grove with her boyfriend earlier this week. She's carrying a beautiful tri-color Céline Luggage Tote. I love how those aqua suede side panels contrast with the textured leather. Here's Selena Gomez, walking the event carpet at Billboard's 10th Annual Women in Music celebration, which took place on December 11th in NYC. She's carrying a deep, inky black Louis Vuitton Petite Malle Crocodile Bag. Finally, here's Serena Williams, arriving at LAX with one of her favorite travel bags, the MCM Liz Reversible Tote. We just saw her sneaking out of LAX with this same bag last month.